It’s done! She waited through 2 birthdays, 1 anniversary, 1 Christmas, and 1 Valentine’s Day… but it’s finally done, and she seems to feel that it was worth the wait. /phew! 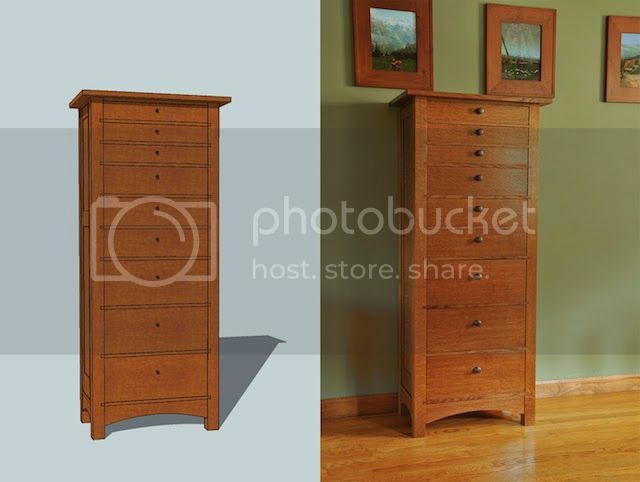 For all the details in the 8 month build of this dresser, feel free to check out my woodworking blog where I attempted to document each step as best I can. In which I attempt to catalog what went right, what went wrong, what I’ve learned, and what mistakes I’ll try to avoid in the future. I’ve added several firsts in this project. A real shooting board plane on an accurate shooting board is a thing of beauty, speeds up accuracy chores like nobody’s business, and is totally worth the cost. I made my first donkey-ear shooting board attachment so I could plane accurate miters on 1/8” thick material. It’s just a quick jig so I could get back to work, so I didn’t make it nice, but I’ve already thought of ways to improve it for the long term. I made my first sticking board so I could plow grooves in narrow stock. A carbide-tipped bandsaw blade is also worth the cost. A power thickness planer is absolutely worth the cost. Overall I’m pretty satisfied with the grain orientation and selection for key parts. 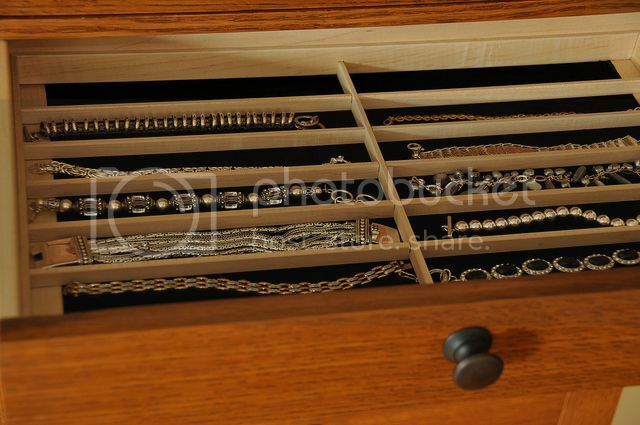 The top 6 drawer faces all came from the same board. The bottom 3 drawers were from a separate board but the dye really evens their appearance out nicely. Zach at Dunham Hardwoods did a fantastic job, once again, in hand-selecting defect-free, color-matched, beautifully figured hardwood for my project. Thank you, Zach. I broke the brass thumb screw that locks the depth stop on my Small Plow Plane. Lee Valley was kind enough to send a free replacement, but that knob broke too. I kept tightening down because the depth stop was still moveable. Marty at Lee Valley worked with me for a few weeks. He sent a brand new plow plane, 2 brass thumb screws, and another depth stop post so that I could compare. They asked me to mail in my plane for their inspection, ended up mailing it back and asking me to compare it to the new one and keep whichever was performing better. This level of customer service is incredible. They really went above and beyond in standing behind their product. If I wasn’t already a loyal lifetime customer, I would be now. I’m happy to say that we found a combination of depth stops and associated parts that lock the depth stop in place better. I broke the drill bit in one of my hollow-chisels for my mortiser. I haven’t been happy with the set that came with the tool anyway. I should have saved my money and gotten a Powermatic, but I’ll settle for upgrading the chisels before the next major project. I never replaced those phillips-head screws for the back panels like I said I was going to. I got too tired and didn’t want to wait for an order of screws. Note to Chris Schwarz: don’t look back there. The aniline dye bled into the maple drawer sides. I attempted to tape these off to keep them pristine, but it didn’t work out. Next time I’ll prefinish the drawer fronts and then assemble. Then when I’m fitting the drawers, I’ll just plane their end grain off. If I go in carefully with a paintbrush I might be able to just darken them a bit without it bleeding into the maple. The only other method I can think of is to make my dry-fit as close to the drawer opening as possible so I don’t have to remove any material. Not sure how I feel about this approach. I continue to have trouble with drawbore pins blowing out the grain on the far side. Quartersawn White Oak is brittle in parts, so that certainly doesn’t make it any easier, but I need more practice. I kinda wish I made narrower pins in the dovetails. 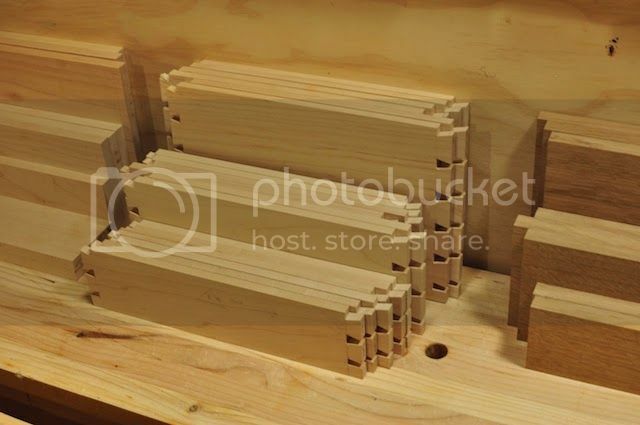 These look like they could have been made by a machine router bit. I was super nervous going into that phase of the project so I gave myself extra room to screw up, but I think I’ve got the hang of it now and can start leveling up my dovetails. The top isn’t perfectly flat because my workbench wasn’t perfectly flat. It’s close though. If I were to build another bench I don’t think I’d bother with the split-top. One solid surface seems like I’d enjoy it better. Add it to the list! 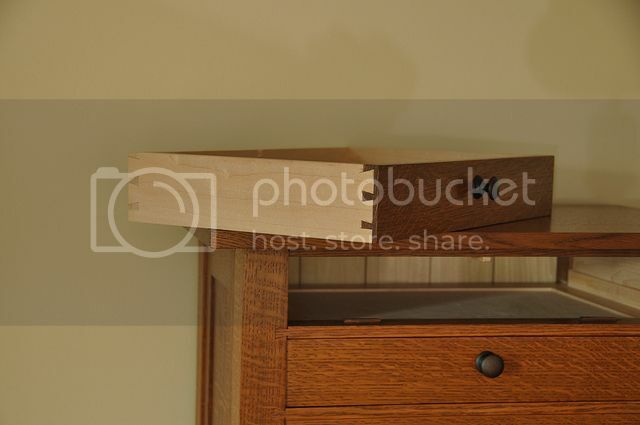 I took a bit too much wood off a few of the drawer sides when fitting them, removing the possibility of a piston-fit. 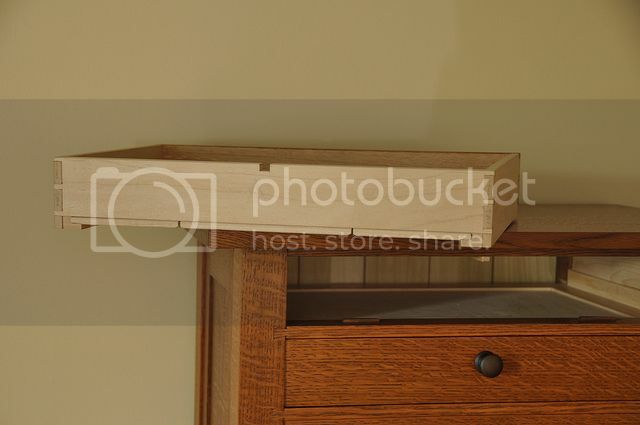 I had to glue some thin shims to the drawer guides in the lower drawer bays and then plane them back down until the larger drawers stopped jamming. I admit I was impatient at this point and wanted the drawers in and done, but this is the worst kind of mistake after all this work. It’s so important to slow down here and take super light passes and keep retesting the fit over and over again. Once you go too far it’s too late. 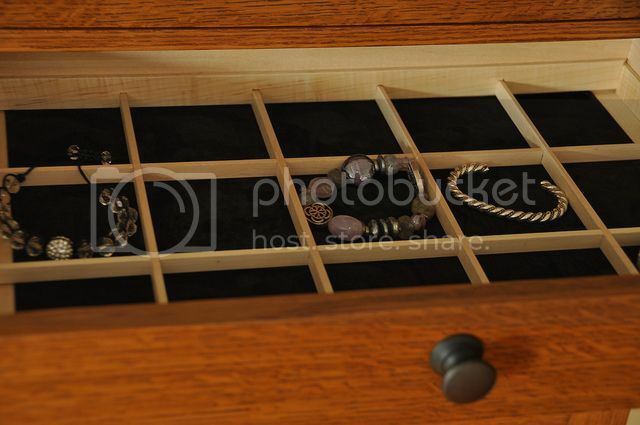 My drawer closing stops were positioned too close to my drawer guides, thus preventing my large shoulder plane from fitting in there to tune the drawer guides like I intended. I could have bought a smaller shoulder plane, but I chose not to. If I had it to do over, I would have used a rabbeted guide as Mario Rodrigues does (See Popular Woodworking - February 2009 - Issue #174 - 7 Strategies for Better Drawers ). I should have planned the assembly better in the design phase. I think the main carcass glue-up exceeded 70 parts. I did a ton of dry-fit practice runs beforehand, but still… stressful isn’t the word. Also, despite them fitting perfectly during the dry-fit, the sliding dovetail webframe fronts didn’t seat flush with the legs. They’re probably 1/128” – 1/64” proud of the surface. I beat on them with a mallet really hard, but no luck. And since they were pre-finished, I couldn’t plane it flush after assembly. Maybe I won’t pre-finish this type of assembly next time for this very reason. I’m officially done with my Benchcrafted Classic Leg Vise. Moving that peg manually every time I change thicknesses bugs me. I’ll be upgrading to their CrissCross version in short order. I still hate machine routers. I had to use it for the 52” long lock miters in the legs. If I can figure out a way to do this by hand, I’ll probably do it. It’ll be safer, quieter, slower, and with less potential for grain explosions. 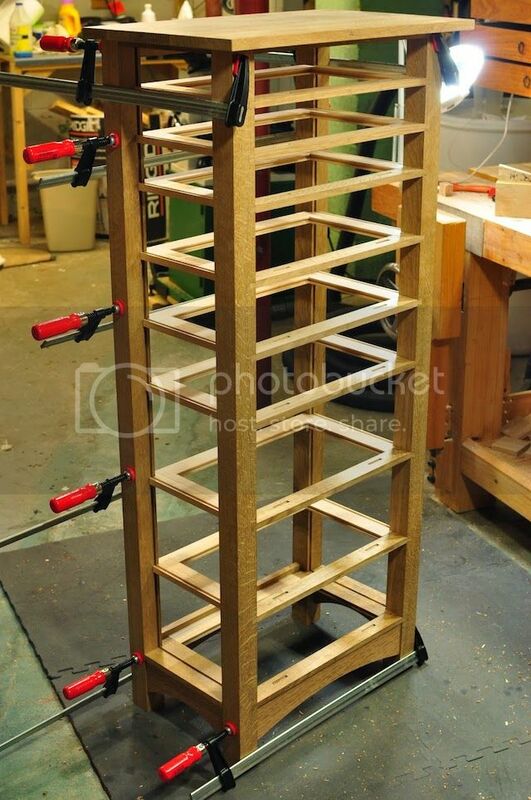 These past few woodworking projects have taken so much focus and dragged out for so many months that upon completion there’s a real sensation of …emptiness? at not having them within my care and attention anymore. Still, I’m relieved to have this dresser completed. When I brought it upstairs, Carolyn asked me how it feels to finally be done, and I guess I was sort of in shock about it because I just felt completely numb and thoroughly wiped out. It was as if the cumulative weight of the entire project came crashing into me. I wasn’t allowing myself to pay attention to all the steps it took me to climb the mountain and only now turned to look back to see where I’ve been, and the length of the journey is daunting. As with all of my work, I continue to see tiny flaws here and there. Mistakes no one else will notice, and I’ve written them here just as a reminder to myself. They don’t really matter much, as they can’t outweigh the beauty of the end result, but nowadays the flaws are in areas I wouldn’t have anticipated. 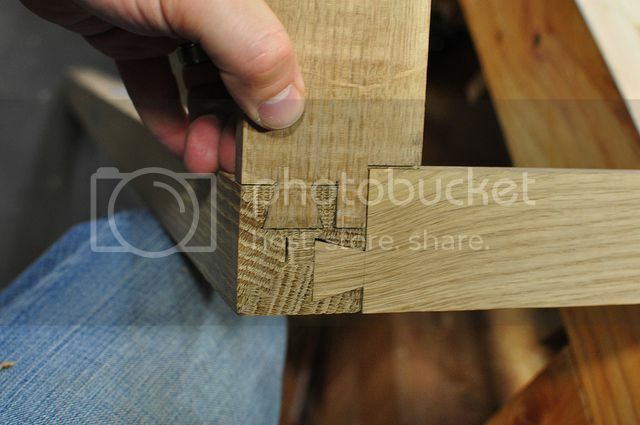 It’s not an obvious flaw like a bad-fitting joint or bad finish. It’s more about design, where I should have paid more attention to grain direction, or realized that a board oriented in that fashion would display flatsawn grain and not quartersawn or riftsawn grain (which would have been more preferable). I don’t think this is the kind of lesson I can learn from books or blogs… I gotta make those mistakes myself and consciously decide to avoid them in the next project – the sort of wisdom that comes with the actual experience of doing the thing. You put up with me when my brain latches onto a complicated puzzle and can’t let go. You wait patiently while the project invariably drags out into several months, looking forward to the time when I can return to spend time with you and our family. When you do complain, it’s out of worry for my happiness in pursuing this hobby, am I enjoying it or am I pushing myself too hard? You do without me so that I can have this activity in my life. You carry the weight of my absence and keep our home in one piece. You don’t add anymore pressure to me than I’ve already added to myself. You’ve waited and watched for years as I built furniture for other people. ...and you’ve never asked for something to be built for yourself. For all of these reasons and more, I give you this. The depth of my knowledge. The height of my creativity. The intensity of my focus. The fullest expression of my love. You did a great job on the chest. 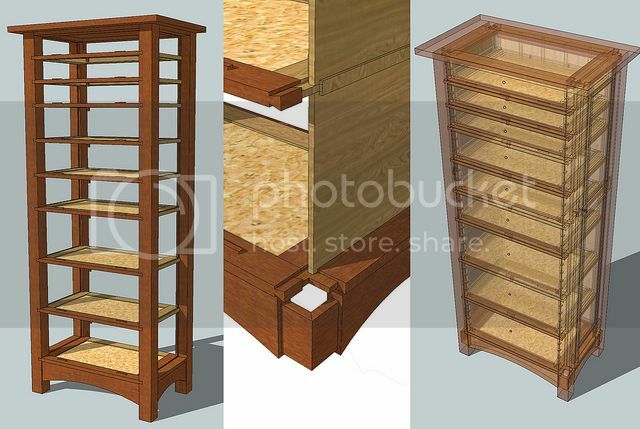 It looks well constructed, with lots of fine details inside and out. Blog of the year. Steve, thanks for sharing so much about the good, the bad and the beautiful. Beautiful chest and beautiful work for a beautiful wife I’m sure! (They have to be beautiful to put up with us lumberjocks sometimes I think!) Great job. 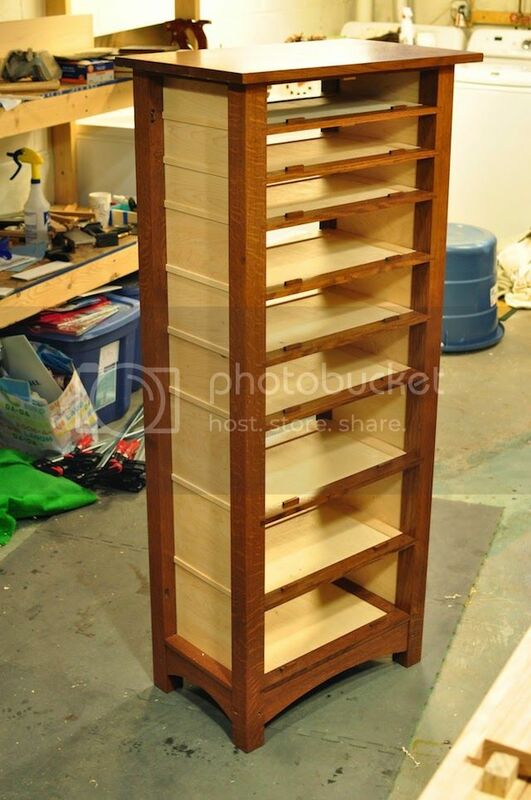 Love your dovetails and finish work is excellent! Great words to your lovely wife and a great signature line too! Your precision is breathtaking. I can only dream of that level of precision. I agree with JCantin. The quality of your design, build and blog is really unsurpassed. My skills will never come close to this. Wow, very nice build and a lifetime heirloom piece. The design, execution and project posting are all first class! Thanks for shairng. Nice work and design. You needn’t beat yourself up over the glitches. I would recommend you reread your post before you start your next project if you are like me because I always forget those lessons learned. But maybe that is my advancing age. Even if I write myself notes, I lose the notes too. It is absolutely beautiful and very well done with a great presentation. Stunning project. The finish looks perfect. I love the sliding dovetails and the door on the side is genius. Well you chose the most difficult joinery available, and it paid off in spades. 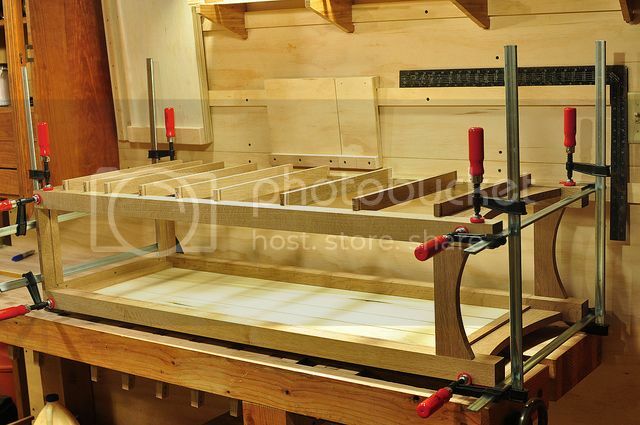 Maybe you can give yourself a break and use dados and standard tenons on the next project. I like the design, construction, and blog too. The color is really pleasing to the eye.